A Plus Computers provides high quality and competitively priced computer repair services to the High Desert communities and the citizens and businesses Apple Valley. 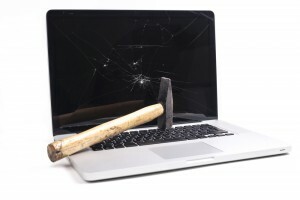 Our Apple repair services offer the same standard of quality found in any Apple Repair Center, without the long wait. All of our services begin with a free diagnostic. We feel that it is important that you know what is wrong with your computer along with the options that are available to repair your system. A Plus Computers offers competitive prices, quality services, and quality parts for all of our Apple repairs. The Apple EFI, although introduced to allow users the ability to protect their system in unique ways, has caused constant confusion and headaches for many. The new firmware was designed to upgrade the Apple security from older Macs to a more modern security, through the use of a special EFI password. The most advanced change is that the new EFI prevents users from bypassing the system security. We can remove the EFI password option and allow you to have complete control over your computer. We can also help you recover/remove old passwords. A Plus Computers understands just how important your computer is to you. We offer diagnostics, repairs, upgrades, and replacement services in a quick, yet high quality environment so that your computer receives high quality repairs as fast as possible. To help speed up that process we carry a full line of computer repair parts, tools, and host a large library of software. Our repair time, on average, is faster than Apple. A Plus Computers provides the best computer repair services at competitive prices for the community of Apple Valley. We call the High Desert home, and as such, want to provide the best service, advice, and support to our community. We can help you diagnose computer issues, provide you with expert advice, and technical repair services. We begin every consultation with a free diagnostic and then provide you with the best information. We want our customers to be informed every step of the way. It is important that customers be able to make informed decisions when it comes to computer repairs. Technology is constantly advancing, and an upgrade can help speed up your computer’s process time. Technology is also dangerous, but the installation of a powerful set of antiviral, antimalware, and antispyware software is a good step in the right direction. We can also help you recover data from computers, laptops, and thumb drives. If you are experiencing problems with your computers, bring it in and let us offer you a free diagnostic.